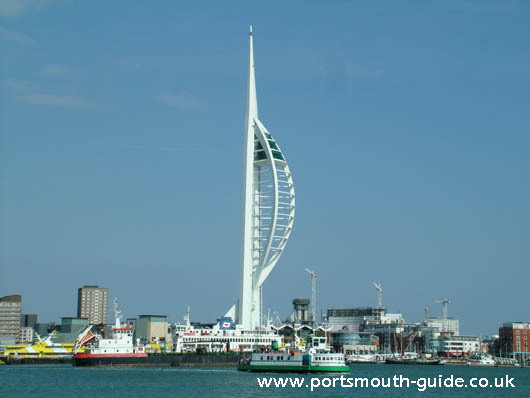 The spinnaker tower is situated at the entrance to Portsmouth Harbour within the Gunwharf Quays development. It is 170 metres tall and consists of three viewing decks the bottom of which has a section of glass floor. On a clear day you can see for 23 miles. The high-speed lift will whisk you to the top of the tower at a speed of 4 metres per second, taking just 30 seconds to reach the top of the tower. The Spinnaker tower was opened to the public in October 2005 and the towers distinct design can be seen for miles around and at night the tower is illuminated. The towers first illumination was coincided to take place as part of the Trafalgar 200 celebration on the 28th June 2005. The tower is built in the sea and employed many state of the art engineering techniques to construct it. The tower offers viewing decks at 100m, 105m and 110m and is two and a half times the height of Nelson’s column. The design is of a sail billowing in the wind. Work began on the tower in 2001 with it slowly growing over the years until in October 2005 it was opened to the public and cost a total of over £35 million to build. In June 2015 a multi-million pound deal was struck with Emirates Airlines to sponsor the Spinnaker Tower. 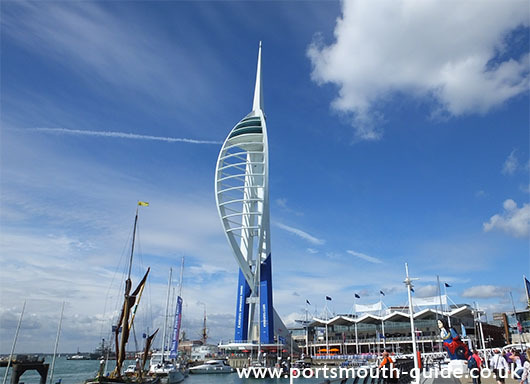 The tower's colour will be changed to blue, white and gold, and the Spinnaker Tower became known as The Emirates Spinnaker Tower. As part of the deal Portsmouth will be advertised by Emirates in their VIP lounge and magazines. To visit the Spinnaker Tower's website please click here. 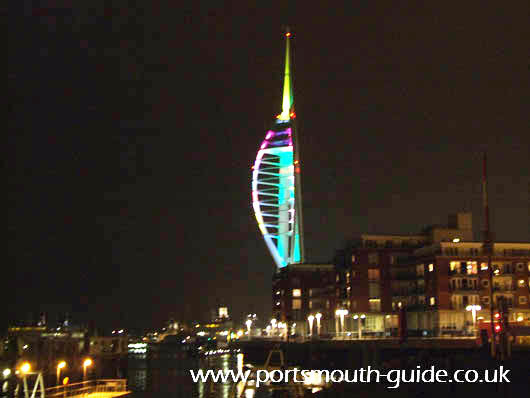 The following picture is of the Spinnaker Tower illuminated, taken on 1st January 2009. Below is an animated series of photos showing the towers creation.